The world of protein powders is a crowded one. From body building brands, to those pitched as endurance recovery products. Yet, the range of protein powders from Motion Nutrition stands out from the crowd; because they are organic protein powders, with none of the unpronounceable additives and preservatives found in many competitors' offerings. 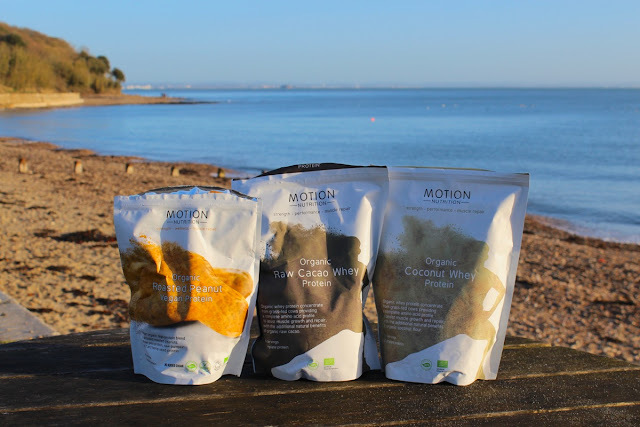 I have been testing out three of the protein powders from the Motion Nutrition range: the Coconut Whey Protein, Raw Cacao Whey Protein, and Roasted Peanut Vegan Protein. The Motion Nutrition powders are far lower in sugar and flavourings than most, and as a result they have a more subtle and natural flavour. They do require thorough mixing in a good shaker, to avoid lumps, and I actually found them best blended into fruit smoothies made with either milk or dairy-alternative drinks. It has always bothered me that many of the leading brands put so much sugar and preservatives into their recovery protein drinks. Is it really necessary? What are they covering up? The protein powders from Motion Nutrition taste far more natural, and also seem to be kinder on the stomach. If you are keen to consume less sugar, eat organic, and keep a close eye on what you are putting into your body, then this range is a great one to consider.